The Best PowerShell blogs from thousands of top PowerShell blogs in our index using search and social metrics. Data will be refreshed once a week. Powershell newsletter is a comprehensive summary of the day's most important blog posts and news articles from the best Powershell websites on the web, and delivered to your email inbox each morning. To subscribe, simply provide us with your email address. San Francisco, CA About Blog Get latest updates of PowerShell from Reddit. Windows PowerShell (POSH) is a command-line shell and associated scripting language created by Microsoft. Offering full access to COM, WMI and .NET, POSH is a full-featured task automation framework for distributed Microsoft platforms and solutions. Facebook fans 1,206,953. Twitter followers 572,702. About Blog An aggregated feed from the PowerShell community. Facebook fans 984. Twitter followers 1,064. Meridian, MS About Blog Mike F Robbins is a Microsoft MVP on Windows PowerShell and a SAPIEN Technologies MVP. He is a co-author of Windows PowerShell TFM 4th Edition and is a contributing author of a chapter in the PowerShell Deep Dives book. Facebook fans n/a. Twitter followers 5,067. Syracuse, NY About Blog A blog devoted to Windows system administrators who need to do more with less. This blog will focus on Windows PowerShell, automation and DevOps. Facebook fans n/a. Twitter followers 14,103. About Blog Richard Siddaway's Blog of PowerShell and other things. Internet About Blog The “PowerShell Magazine” is an online magazine serving exclusive PowerShell content with 60 contributing authors and five PowerShell MVPs! Facebook fans 7,563. Twitter followers 16,654. Worldwide About Blog PowerShell.org is a collection of online and in-person resources for the global PowerShell community. Its mission is to provide education, resources, and community for users of Windows PowerShell across the world. Facebook fans 2,935. Twitter followers 10,543. Katowice, Poland About Blog Evotec is a team of professionals helping out small, medium and large businesses to grow. Evotec team has huge experience in IT. Facebook fans 287. Twitter followers 44. About Blog Get the latest information, insights, announcements, and news from Microsoft experts and developers in the PowerShell MSDN blog. Orange County,CA About Blog I love to explore and discover how Powershell works. Facebook fans n/a. Twitter followers 1,258. Brussels, Belgium About Blog I’m a Microsoft PowerShell MVP, specializing in SQL Server, PowerShell and network security. I’m also a proud Cajun, who’s living it up in Belgium, doing systems stuff. Facebook fans n/a. Twitter followers 4,906. About Blog dbatools is an awesome PowerShell module that helps you migrate entire instances with a single command, plus a whole lot more. Facebook fans n/a. Twitter followers 2,093. Evansville, IN About Blog Senior Systems Automation Engineer, writer, trainer, Microsoft Cloud/Datacenter Management MVP, fiercely independent, laid back guy that loves sharing. Facebook fans n/a. Twitter followers 5,464. Cyprus About Blog PowerShell Scripting. This is Stephanos Constantinou Blog with many scripts written on PowerShell that may help you out to solve issues that you may have in your systems. Visit and let me know your thoughts. Facebook fans 391. Twitter followers 154. Bangalore, IN About Blog Ravikanth is a virtualization, cloud, and enterprise application expert and works at Dell Inc. as a lead engineer in Enterprise Solutions Group. He is a multi-year recepient of MIcrosoft Most Valueable Professional (MVP) award. He is a well-known personality in the PowerShell community and a published author. You can hear him speak regularly at BITPro and PowerShell Bangalore user group meetings. Facebook fans n/a. Twitter followers 2,984. Nashville, Tennessee, USA About Blog My blog is here to help solve issues I have encountered and solved, publish scripts I have written, and educate others in understanding areas that are not well covered. These blogs cover many different aspects of IT, but are mainly concentrated on software deployments. Facebook fans 718. Twitter followers 1,056. Dallas, Texas About Blog Hi! I’m Chris Goosen and welcome to my blog! I work as a Technology Consultant based in Dallas, Texas.I am very passionate about communication and collaboration technologies, in particular Microsoft Exchange Server. Facebook fans n/a. Twitter followers 714. New Delhi About Blog My name is Prateek Singh. I’m in the information technology (IT) industry, formerly working as Windows Server Engineer and now mostly into Scripting and Automation related development. I’m a big fan of Microsoft’s Windows PowerShell, a product that’s included with their Windows operating system and which is designed to facilitate the automation of IT administration and operations. Facebook fans 550. Twitter followers 1,049. Las Vegas, NV About Blog My name is Don Jones. I’m in the information technology (IT) industry. I’m a big fan of Microsoft’s Windows PowerShell. I'm a Curriculum Director for IT Ops content at Pluralsight, a PowerShell MVP, and a longtime author, speaker, and journalist in the IT field. Facebook fans 785. Twitter followers 16,007. About Blog Hi everyone, on my blog i will describe some field experiences and solutions. At the moment I work as a system engineer in a middle sized system vendor. My daily work mostly contains consulting and implementing server solutions with Microsoft products. Hopefully my blog can give some helpful advice for some issues which normally never occur. Cincinnati, Oh About Blog The topics to be covered in this channel are SQL Server, PowerShell, Active Directory, and whatever else fun Shane comes up with along the way. Watch videos on Youtube. Facebook fans n/a. Twitter followers 8,935. Redmond, WA About Blog This is the official Microsoft PowerShell Engineering Team Channel. Watch videos on Youtube. Facebook fans n/a. Twitter followers 11,714. Seattle, WA About Blog Lee Holmes is a Lead Security Architect for Azure Management, Azure Stack. PowerShell developer, author, and Maker of the blog Precision Computing. Facebook fans n/a. Twitter followers 12,120. Belgium About Blog This blog will host some of my notes which I think could be useful to fellow PowerShell explorers. Facebook fans n/a. Twitter followers 9,203. Melbourne, Australia About Blog Welcome to my blog! My name is Tao Yang, I am a system engineer based in Melbourne, Australia. I spend most of my time working on Microsoft technologies. This blog provides a place for me to share my thoughts on various aspect of enterprise system management, especially SCOM, SCCM and PowerShell scripting. Facebook fans n/a. Twitter followers 1,742. Port St. Lucie, Florida About Blog I’m Maximo Trinidad from Puerto Rico, have been working with computers since 1979. I have worked with SQL Server Technologies, provided support to Windows Servers/Client machines, Microsoft Virtualization Technologies, and build some Visual Studio solutions. I’m a Microsoft PowerShell MVP since 2009 and MVP SAPIEN Technologies. Also founder of the Florida PowerShell User Group. Facebook fans n/a. Twitter followers 1,221. Israel About Blog I am an Infrastructure Consultant specializing in IT process automation and migration projects in different environments such as VMware vSphere, Microsoft Active Directory/DNS/SQL/Exchange, EMC/NetApp storage systems, IBM server farms, HP blade systems and Linux OS using PowerShell, VBScript, PowerCLI, Perl and bash. blog by Roman Gelman. About Blog A hard, rough, abrasive look at camel spotting...no dromedaries...no virtualization. Stockholm About Blog My name is Fredrik “Dalle” Wall. This is my own space on internet where I will publish articles about PowerShell, Active Directory, Deployment and Client Management. Facebook fans n/a. Twitter followers 917. Melbourne, Victoria About Blog Scripting Library is a collection of scripts and experiences shared by IT Pros, Developers and Geeks across Linux and Windows OS from all over the world. This website is created and maintained by Paolo Frigo with the aim of learning by sharing a passion for IT and create an open repository where constantly being inspired and having fun. About Blog Signal Warrant Officer stuff, Powershell scripts, SCCM stuff, other tech crap and whatever else I think the world needs to know. Facebook fans 105. Twitter followers 53. Puerto Rico About Blog Security Weekly Podcast, Infosec Tactico podcast, Microsoft PowerShell MVP, Metasploit contributor and all around techie. Opinions are my own. Facebook fans n/a. Twitter followers 35,914. United States About Blog I am a Solutions Architect at Pure Storage, where my focus is to help customers take advantage of the flash technology benefits with Microsoft server products that include Azure, Azure Stack, Windows Server, SQL Server, Hyper-V, Exchange and System Center. Republic,MO About Blog My name is Mike Shepard, and I’m currently a Solutions Architect (whatever that means) for a software company focusing on financial institutions. I’ve been writing code since I first saw an Apple computer in the early 80’s. I enjoy coding in PowerShell (duh), Python, and VB.NET, and usually end up hooking whatever I write to a database of some sort. Facebook fans n/a. Twitter followers 145. UK About Blog PowerShell/Lync Geek, Grateful Dead/Jerry Live Recording Enthusiast and living in the UK. Thomas Lee's collection of random interesting items, views on things, mainly IT related, as well as the occasional rant. Facebook fans n/a. Twitter followers 2,220. Bergen, Hordaland, Norway About Blog Co-founder of Firstpoint AS, Firstpoint Bergen AS, Firstpoint Oslo AS, Firstpoint Holding AS. Love automation, Cloud, Powershell and Azurestack. Paris, France About Blog A piece of my work around PowerShell and IIS (or usefull things I've found on the web). Especially some reminders for myself! About Blog Tim Curwick's PowerShell blog, tips and tricks, tools, and techniques, explanations and explorations. Montréal, Québec About Blog I’m Francois-Xavier Cat and I’m a Systems Engineer focusing mostly on Microsoft and VMware technologies. I created this blog mainly for the purpose of documenting my day-to-day work. Often I find myself referring back to old posts on troubleshooting issues or previous implementations to help me resolve current problems or tasks.LazyWinAdmin is a blog about by day to day SysAdmin life. Facebook fans 476. Twitter followers 3,043. Online About Blog The PASS PowerShell Virtual Chapter is geared towards those wanting to learn more about PowerShell and to share best practices. Facebook fans n/a. Twitter followers 950. Somerset About Blog Hi, My name is Rob. I am a Microsoft Cloud and Data Center Management MVP. I love automation and am a big Powershell evangelist. Facebook fans n/a. Twitter followers 3,495. Phoenix, Az About Blog Welcome to the blogsite of MCTExpert. I am a Microsoft Certified Trainer specializing in PowerShell and Windows Server/Client. Facebook fans n/a. Twitter followers 632. About Blog Get latest updates from Powershell Blog. Netherlands About Blog PowerShell, VMware, and anything else I find interesting or keep forgetting. British Columbia, Canada About Blog Charlie Russel has been a Microsoft MVP for Windows XP, Security, Windows Server, and Windows PowerShell. He’s a chemist by education, an electrician by trade, a UNIX and Windows sysadmin and Oracle DBA because he raised his hand when he should have known better, and an IT Manager for a major international software and security company by choice. He’s also an instructor at the University of BC. Cloud City, Bespin About Blog Jonathan Medd is a Senior Consultant with Xtravirt based in the UK. He co-hosts a regular PowerShell podcast which contains info on how to learn PowerShell and what’s going on in the PowerShell world. Colorado, United States About Blog I am a software developer working primarily in .NET technologies such as C#, WCF, WPF, ASP.NET MVC, etc. I am also a Microsoft Windows PowerShell MVP (since 2006). You can usually find me on StackOverflow answering PowerShell questions. I am also the project coordinator and a primary contributor to the PowerShell Community Extensions project on CodePlex. About Blog Get the latest information, insights, announcements, and news from Microsoft experts and IT professionals in the TechNet blogs. Hannover, Germany About Blog PowerTheShell is an informational electronic PowerShell paper and updated by PowerShell MVP Dr. Tobias Weltner. Massachusetts, United States About Blog Learn about Windows PowerShell. In this blog post, we looked at the debugging features of Visual Studio Code and the PowerShell extension. Facebook fans 827. Twitter followers 31,307. Bellevue, Nebraska About Blog Learn Powershell blog is authored by Boe Prox. He is a Senior Windows System Administrator and has been using PowerShell since 2008. He is also a recipient of the Microsoft MVP award in Windows PowerShell. Facebook fans n/a. Twitter followers 4,405. Bangalore, India About Blog A blog about PowerShell, Active Directory and Configuration Manager Experiments of mine. Facebook fans n/a. Twitter followers 1,562. Stockholm, Sweden About Blog Technical Architect with Knowledge Factory. PowerShell Hero and Microsoft MVP. The opinions on this blog are my own. This blog is intended to be a place where I can share my notes and experiences and I hope that some one else will have good use for it. Facebook fans n/a. Twitter followers 3,980. Switzerland About Blog Stephane is a dynamic and passionate Cloud and datacenter Microsoft MVP since. He is the founder of the Basel PowerShell user Group (BPUG), the co-founder of the French Speaking PowerShell UserGroup (FRPSUG), author, blogger, and received the community award "PowerShell Hero" from PowerShell.org. Facebook fans 917. Twitter followers 1,305. Munich, Bavaria About Blog Hi. My name is David and I work as Premier Field Engineer at Microsoft Germany. My specialties are Dev, Powershell and Windows 10 Client and I am focused in client workshops and dev requests. Beside my work I write my own blog and speak at conferences on PS/Dev topics. Facebook fans n/a. Twitter followers 2,724. The Netherlands About Blog Posts about PowerShell written by Robert van den Nieuwendijk. Facebook fans n/a. Twitter followers 1,146. 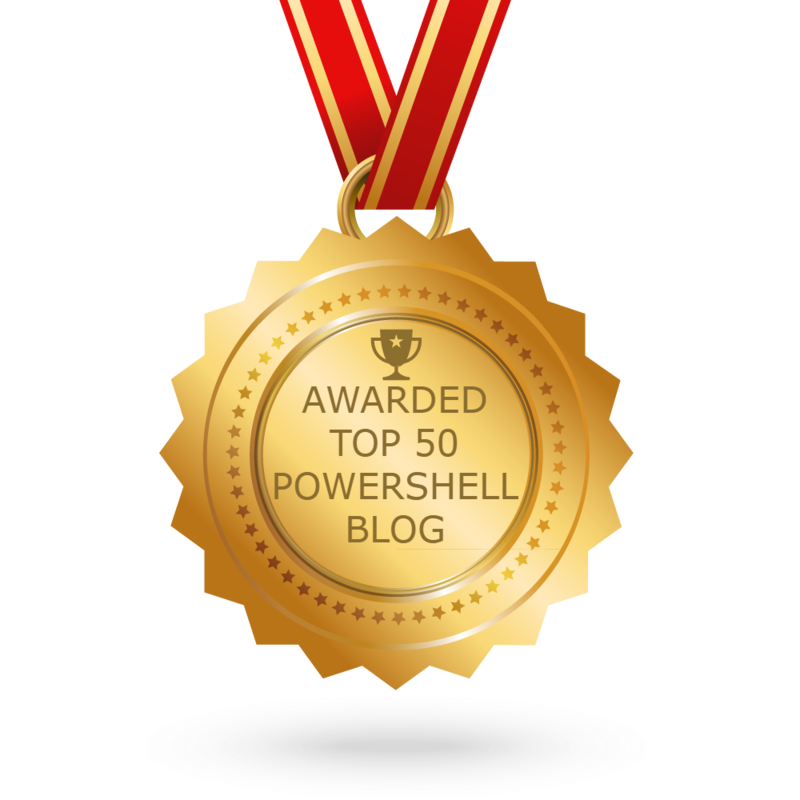 CONGRATULATIONS to every blogger that has made this Top PowerShell Blogs list! This is the most comprehensive list of best PowerShell blogs on the internet and I’m honoured to have you as part of this! I personally give you a high-five and want to thank you for your contribution to this world.